A few years ago, my husband Lance and I toured the Boise Open Studios, which happens the second weekend in October. This year, the Artists’ Open Studios weekend tour is October 13th through the 15th. 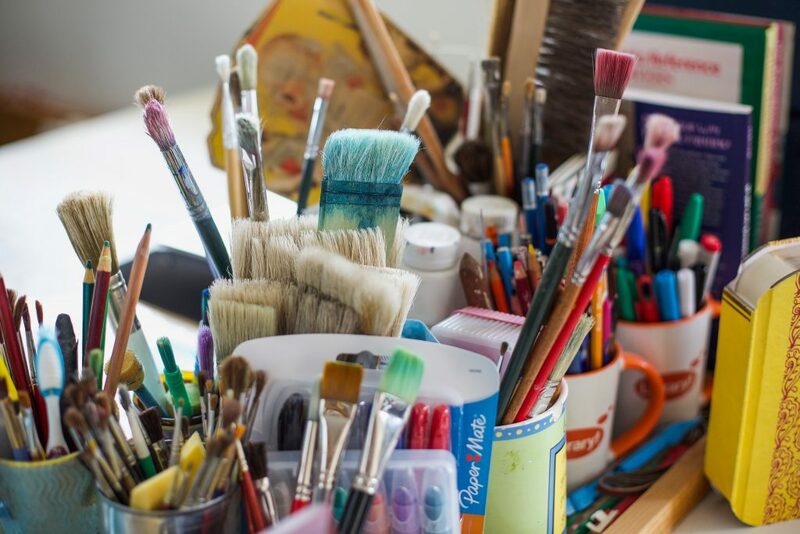 Get a glimpse into the artistic mind and visit with artists in multiple media in their work spaces. 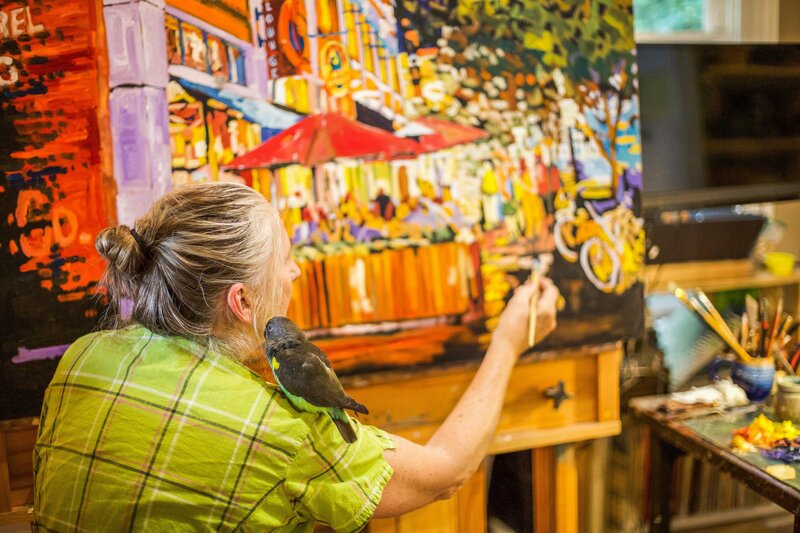 You might get a chance to see an artist’s demo, too. 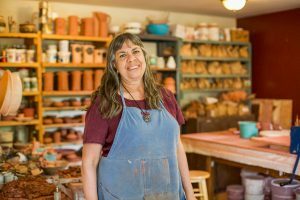 Get inspired by stories of their work and their artistic journey, see the tools they use, and get to know them, just like you might if you owned a gallery. 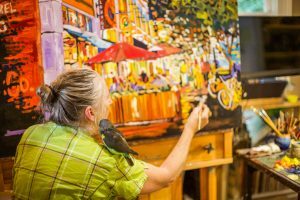 Here is a brief glimpse of just a dozen of the more than 60 local artists who are opening their doors to the public to reveal their creative processes. Bonnie Peacher (Mediums: Acrylics, Pastels). 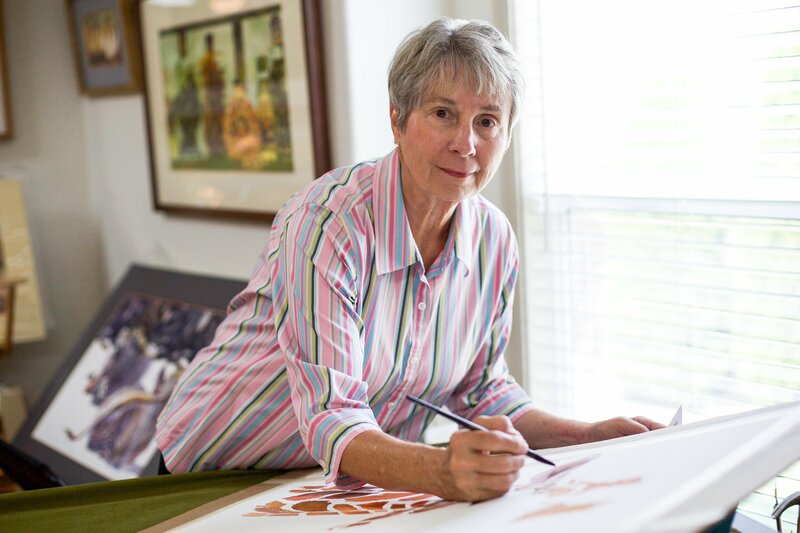 Bonnie Peacher holds a BFA from BSU with an emphasis in painting and art history. 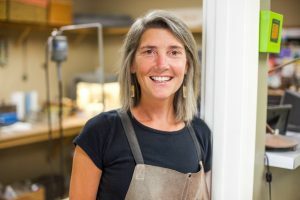 Her award-winning work has appeared in more than 150 exhibitions and collections, including The College of Idaho’s permanent “Idaho Women’s Collection.” She is also active in the local art advocacy and education community. 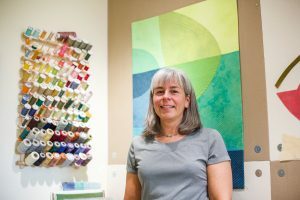 She has held positions with BOSCO, TVAA, BAM docents and is the current curator for the Garden City Library Arts Exhibition program. She enjoys teaching, drawing and painting to a diverse set of students. “My artistic focus is the human form. I look for subjects that have interesting faces or an unusual presence. I believe a true portrait must be both a likeness of the subject and an artistic interpretation. While my paintings are realistic, it is even more important to me to paint a feeling. In order to stimulate the mind as well as the eye, I invite the viewer to discover and reflect on this specific point in time in my subject’s life, as one of many that make up layers of their story. Derek Hurd (Mediums: Custom Furniture – Hardwoods, Metal, Glass, Cork). Studio1212 is a design and production handmade furniture studio located in the Surel Mitchell Live/Work/Create District of Garden City. “I love opening my studio to the public and meeting so many great people in three short days. I love to hear ‘I had no idea you were here,’ because now they do. Lauren Johnson (Mediums: Watercolorist, Pastel Artist). “After a successful business career, I am devoting my time to my passion of art. Studying under many fine national instructors over the last 25 years here in Boise and in New Mexico, I work in transparent watercolor and water-based pastel and paint a variety of subjects to include animal life, landscape, still life, abstract, floral and portraiture–all with an eye on the design patterns of shapes and values. I have participated in many shows and exhibits, judged the Idaho State Fair, and will have my home/studio open for the BOSCO Studio Open House in October. Karen Klinefelter (Mediums: Art Jewelry). 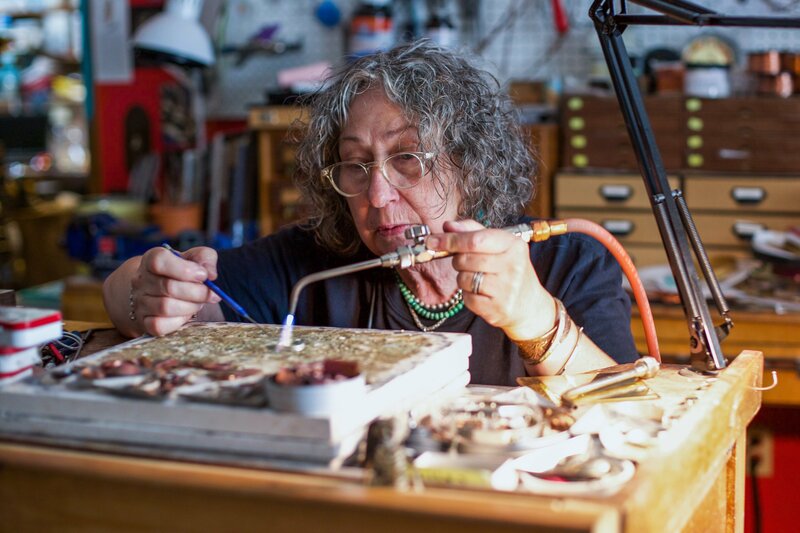 “I’ve been making art jewelry and sculpture for over 25 years. The constant theme has been a fascination with patterns and textures, grids and lines and finishes that oppose one another. The discovery of organic vegetable ivory as a medium challenged my design sense with its fluid and unpredictable shape and nature. My current work is a combination of my love and understanding of the metal, and my delight and exploration in finding my voice in this completely different material. 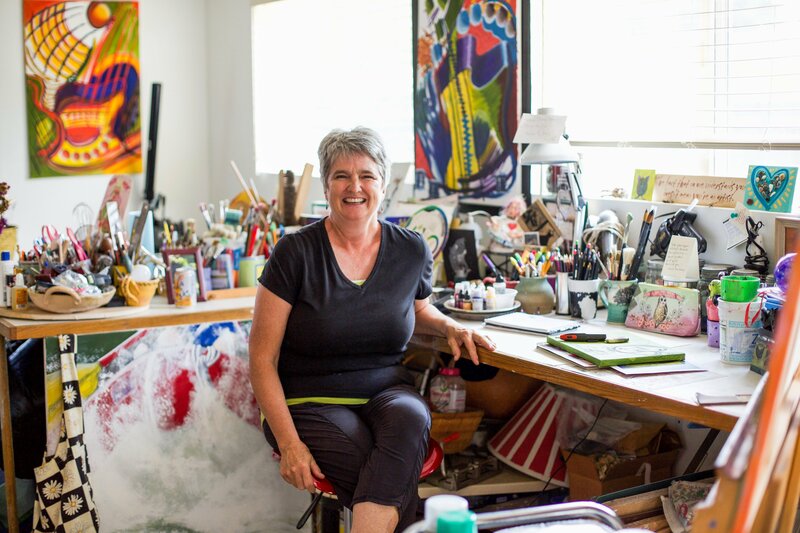 “I love inviting people into my studio space and showing them how I make my work. I travel to art festivals around the country selling my work year-round. BOSCO is a nice opportunity to connect with the community where I live and work and to share my process in a more intimate and informative setting. Lorelle Rau (Mediums: Cut paper collage and mixed media). Lorelle Rau is a contemporary collage artist who uses cut paper and appropriated imagery to investigate concepts of nature and place. In her landscape series, Rau expresses the transformative qualities of nature, particularly the rich contours and textures of the mountains. As an avid hiker, the experience and rawness of the natural world has always been an integral part of her creative process. Rau earned a Masters in Arts Administration from the Savannah College of Art and Design and received a BS in Art Management and BA in Studio Art from Appalachian State University. She enjoys hiking in the Boise foothills and Idaho backcountry with her dog, Tanner, a Shepherd mix. “I’ve lived in several different cities on the east coast from Washington, DC to Fort Lauderdale, Florida, but Boise is by far the most beautiful and exciting place I’ve ever lived. Residing here with immediate access to nature and outdoor adventure has informed my art in so many ways. Lisa Flowers Ross (Mediums: Fabric). Lisa Flowers Ross creates contemporary, abstract artworks. Inspirations are transformed into simple shapes with an emphasis on line, color and composition. Flowers Ross holds a Bachelor of Arts degree in Studio Art, as well as in Business. 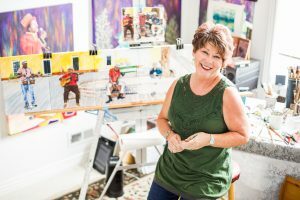 She is a juried artist member of the professional groups Studio Art Quilt Associates, Northwest Designer Craftsmen and Boise Open Studio Collective Organization. She has received grants from the Idaho Commission on the Arts and the Alexa Rose Foundation. 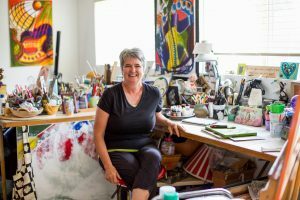 “As a member of BOSCO, it is nice to be a part of this local community of artists and get to know more of them, and I like participating in our major annual event. It is an opportunity for me to share my art with people I might not otherwise get to meet. It is great for the public, because they will be able to see behind the scenes as well as lots of wonderful art that they might not otherwise have access to. “I am an artist who hand dyes my own fabrics that I use to create original abstract wall art, like a fabric painting. In addition, printmaking is something I like to do when I can (even though I do not have my own press). I consider my art as a business and do my best to run it as such. If people can’t make it to my studio for the BOSCO Open Studio Weekend, I am always happy to arrange a private visit as well, as I am sure most of the BOSCO artists would be willing to. My art can also be found on my website at lisaflowersross.net. 50s with some life-changing happenings. I also participate in the local September Art in the Park, which has several BOSCO members showing. 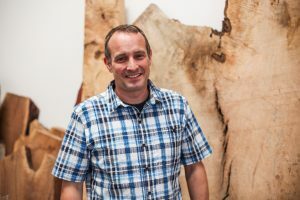 “What I like best about BOSCO is the determination of this varied, talented group of artists to get out there, show their work, and make Boise more aware that we exist. For one weekend a year, all these wonderful spaces of creation open their doors to the public so people can become more aware of all the talent in our community. Kay Seurat (Mediums: Metalsmithing and Jewelry Design, Sculpture, Welded, Found Object, Assemblage Textiles). “As a native Idahoan, I’ve always wanted to be elsewhere. I’ve found that since I never travel as much as I’d like, the best way to fulfill my wanderlust is to immerse myself in the arts and cultures of the world. I accomplish this through my art. Influences from across the globe and through time and space are seen in my work. I still live in Idaho and like it more all the time. “BOSCO is a win-win situation. I get to meet and visit with people who are interested in my work, and they can see what I’m up to. Jessica Tookey (Mediums: Acrylic, Oil, Pastel, Ink, Charcoal, Watercolor and Graphite). 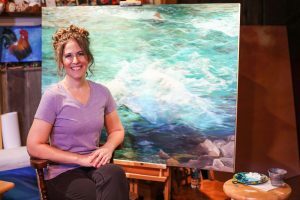 Jessica Tookey has been creating all of her life but didn’t pursue art as a career until 2014, after years of teaching. 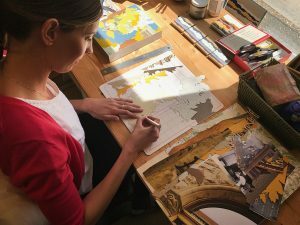 She draws and paints everything, but focuses most on portraiture: giving by bringing light back into the lives of people who have lost loved ones. Patricia Sadler Trainor, d.b.a. Mud Pie Arts Pottery (Mediums: Stoneware Clay). 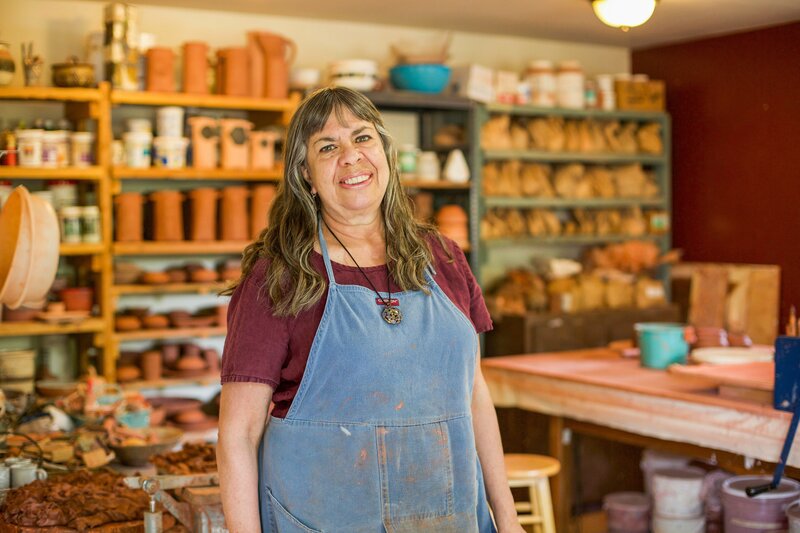 “I began working in clay about 25 years ago. Clay combines my love of color, texture, pattern and form. I prefer hand-building, as I can texture clay before formming into a particular object. Travels in Mexico and South America are inspirations for my work. Works incorporate my background in pattern drafting, sculpture, painting and clothing. Flat sheets of clay (slabs) are darted, beveled, stamped, and joined together. I use wax-resist (like batik) when glazing. Cindi Walton (Mediums: Acrylic Paint and Pastels on Canvas; Alcohol Inks on Yupo Paper). “At BOSCO, I get to meet a group of talented, creative artists, and I also have an opportunity to share with the community the where, how and what I create. Besides my big, bright paintings, I am an illustrator, and right now there is a delightful little mouse (inspired by a real one under my sink) appearing in small paintings. 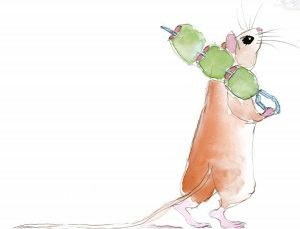 These small paintings make me smile and I invite readers to my studio in October to see his antics.